Cut the tops off a few ball zucchinis and hollow them out. Mix diced green onions, green chilies, low-fat Mexican cheese blend, Tabasco sauce and black beans. 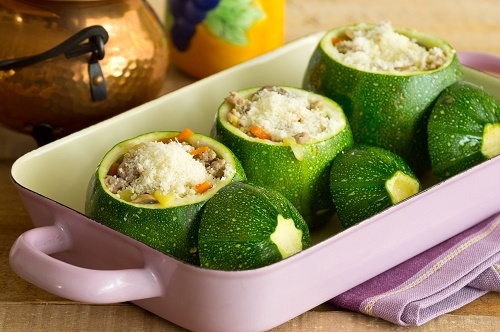 Stuff the zucchinis with this mixture cover in foil and bake at 350°F for 20 minutes . Crumble a little Cotija cheese and press it into the tops of the zucchinis and bake for a half hour more.